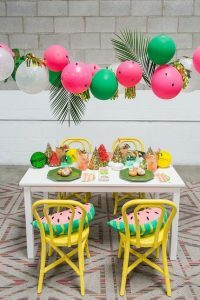 Here’s why the décor of a party really matters; the first look people get of a place when they arrive at a party can leave such an impression on a guest and can set the tone for the entire party. Will you pick a themed event? How do you separate your party from other events if you’re having the party in an open event space? Will you go balloons or flowers? 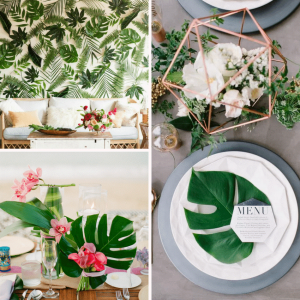 With the summer months well and truly upon us, we decided to look at the leading summer event décor trends that have caught our eye this year so far. … and a great way to inject colour into a room. The trend for ‘fruit installations’ is getting more popular as high-end brands (see picture below) are using fruit to decorate their spaces. But you don’t need a high-end budget to make fruit work in your favour. It can be as simple as hollowing out a pineapple and using it as a vase for flowers as your centre pieces. Fruit-inspired balloons are also everywhere in shops at the moment, making it easier to source decorations. And if guests can nibble at certain fruity décor throughout the party – you’ll be on to a winning streak too – think fruit inspired cupcakes! If you think animals at parties signal a two-year olds birthday – think again! The trend for simple but colourful animal themes like flamingos, has only just begun. 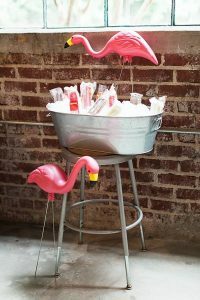 Using a simple animal motif to decorate drinks carts, theme party games (hello flamingo croquet bats!) and inspire your centre pieces can be great for adding a pop of colour to a room and is a great conversation starter for your guests. And if all these rather out-there trends don’t float your boat, take it back to basics and light up the room with simple but elegant lighting decorations. 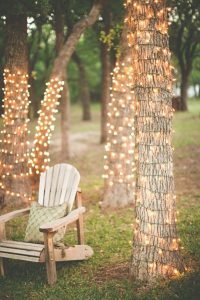 The trend for decorative fairy lights sees people using them within vases, hanging from trees and lit-up canopies or even creating lighting walls as a backdrop for photos. It’s the go-to decoration for evening parties and fabulous for outdoor venues. 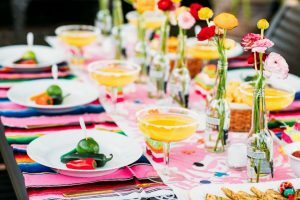 Although themed parties are not as popular as they once were, there’s no denying a Mexican theme around Cinco De Mayo or a Hollywood theme during Oscars season are always going to be huge successes. One thing we’ve learnt through years of events and party planning is to keep it simple. Don’t go over the top with themed bashes because it can be overwhelming to the guest experience (not to mention expensive!). Whether you’re planning a birthday, retirement or work summer party, Everyone Events has got a great list of suppliers and contacts who can help decorate and host your event. For more information on the top centres for hosting events or to enquire about availability and rates, check out the details on the Everyone Events website.